May be its a fake. What about dot after 4? 4.306? And date of last battle 2012-05-08? It's not a fake, or at least the screenshot isn't. You can check the matter by looking up his stats in-game. I bet that this is an arranged battle. Maeby 2 companies from same clan got to fight against each others and other team let him kill almost everyone? It's a wild guess but I doubt I'm wrong: A CW match between two allies. A lone M4 got to kill the whole other team for free. To support this, the screenshot was uploaded 4 days ago and the uploader's clan got hold of a new province (from an ally clan) 5 days ago. That sounds plasible, bordering on tin foil hat thinking... then again this entire score... reeks of fixing somehow. fanttis: It says max. destroyed in battle 5. So I doubt those points with only 5 kills. Link to the forum topic? FIXED. No way you can get that in a Sherman. Well, the biggest amount of EXP could be gained by getting in a CW with allies, Other team full of T30, other has 14 Tier 10 and a single KV. 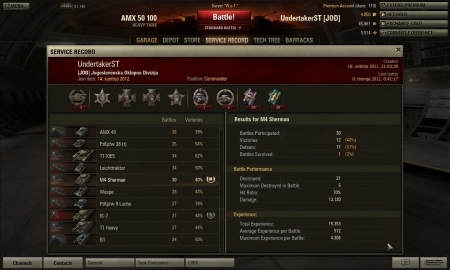 The T30:s kill the other Tier 10:s and then the KV kills the T30:s with AP. Because more exp for enemies is more exp for you. Not to mention he is clan commander. Definetly set up. Considering that he's 1) a somewhat bad player and 2) eastern european, there's no way it can be legit. Arranged battle. It is very conceited statement from You. For sure You are better player than him, but if he is bad player, then 95% players is. He is above average player, no doubt. The other thing is if the result above was achieved legit. And your opinion "he is eastern european so he cannot be legit" is an insult to most of the players. Not to mention that You even do not know that Yugoslavia is Southern Europe, not Eastern. Err, not exactly hard to figure out. He has Kolobanovs and Oskins and max 5 kills in a battle. So he killed 5 tier 9 TD's. You get a bonus everytime you earn a medal on top of him getting high XP for doing damage to higher level tanks. And of course it is set up. The fact: without replay or someone who witnessed the actual game itself we will never know absolute truth. So could we not just let this one game be, it really doesnt matter so much if it was arranged or not. Personally Id love to see some other kind of comments on games here instead the usuall arranged/omg gold ammo/my non-prem is better than your prem. just delete the entry ... entries without game screenshot and/or replay should be generelly be rejected. Garage screenshot is no legit proof! Buy yourself a map then. Plus there is no logic in what tou say. If Yougoslavia IS the East Europe THEN Hungary would be Northern. If you cannoty afford a map, then check for example this link: http://unstats.un.org/unsd/methods/m49/m49regin.htm#europe. Or there is a picture, to make life easier. http://en.wikipedia.org/wiki/File:Europe_subregion_map_UN_geoschme.svg. Yugo do IS Eastern Europe. It's no Southern Europe. What we call Southern Europe is Greece, Italy, Spain and Portugal. It's not a matter of geography, but of culture (plus some remnants of the cold war situation east vs west.). Geography is a fact. What You say is Your opinion. Fact >> anybody's opinion. Yeah, sure kiddo. Do you know that the term "southern europe" never was based on geography? It has nothing to do with being under a meridian. But, whatever you want pal. For us, you'll stay Eastern Europe, forever and ever. And Napoleon Bonaparte still lives and some day will rule the whole Europe again forever and ever. Sznyper, Saankan is right it's a cultural thing and you can say anything you want you wont change it. There is not such thing as Eastern European culture. It's only political manipulation. EOT. Sznyper are you just trolling, I didn't say there was a kind of culture, I say it's a cultural thing. Meaning it's just how it is and has been called that for a very long time. Define off-topic: Bunch of noobs talking about cultures in the comments box of a tank battle game. 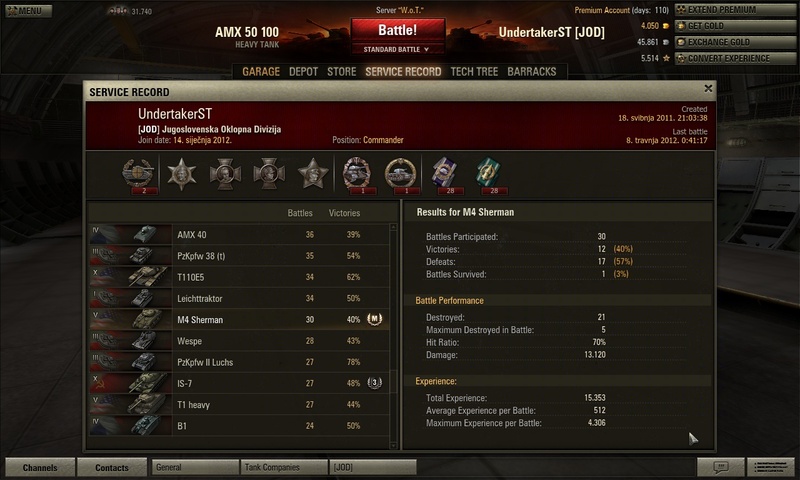 No WAY a 40% W/R SHERMAN gets 4k exp in a battle. Glitch. The average experience he has per match is 381 if we don't count the probable cheat match. 512 xp/match with it. Fake, u don't get 4k xp for killing 5 tanks. Even if he dmg rest of enemies he just can't earn this much xp. It's not a fake, but framed, but if it was framed, why only 5 tanks... Also to note here is that he refers to historical battle, most probably instead of training room it was a battle done in special room, CW most likely. Thus gaining 50% more experience just because of win and from what the enemy team did. So it is highly possible to have 4.3k match due to CW extra. We cannot know for sure, but player himself does know, but most likely is not capable of understanding english to tell us. Leave the stat be... it is valid, even if it is not random battle. There are plenty of CW/TC matches here, get over it. martin.. the screenshot isn't fake, the battle was. We don't really need to care about this. martinmrh, if you look really close you can see this battle was played over a year ago. Much has changed since that.